Being a stereotypical Pinoy who gets really excited whenever her country gets centerstage, these links tickled me pink! Anthony Bourdain finally blogs about his Philippine visit. In the limelight is Philippine Lechon. I think it’s pretty cool that we’re not the only ones who think that our local roasted pig is the bestest evar in the world! And if you haven’t seen the No Reservations episode set in the Philippines yet, you may want to watch this short video clip showing him eating street food. And another one with him munching on beef that’s ugly as hell but is damned good, tapsilog (Aaack, I can’t make the links work. Just look for the video that says Philippines, Missing Scene for the tapsilog one. It’s in the list below the video window) How cool is that? Go wander off, read and watch. Enjoy! I wanna watch the full episode! Now I want Cebu lechon!!! It felt like I was watching more of a “Bizzare Foods” episode kase. Saka medyo naging “drama” yung dating eh. 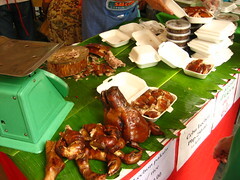 Where’s all the fun, smiles, laughter, all that festive mood that come with Filipino feasts? I would have wanted the world to see that too. Hahahaha, just glare back if someone glares. Everyone’s entitled to their own opinion. I haven’t seen the whole episode yet, but I hope to get it this weekend. So looking forward to it. there’s already a torrent uploaded for this episode if anyone wants to download it, torrentz.com just check the no reservations philippines episode.